View More In Screwdrivers & Nut Drivers. - 4x Plastic Opening Tool. Made of soft plastic to avoid damaging your device. - 3x ESD Tweezers. ESD safe precision tweezers for handling small wires, screws, and reaching where your fingers can't. - 1x utility knife. Cut, scrape and clean. - 1x Anti-Static Wrist Strap. Protect delicate circuits from harmful static electricity. - 1x SIM card ejector pin and LCD Suction Cup. - 1x Spudger. Great for poking and prying tough-to-open enclosures, delicate components, opening ZIF connectors, and soldering applications. - 3x Metal Spudger. For when plastic just doesn't cut it. - 1x 6 Inch Metal Ruler. Makes measuring parts easy! - 1x 58 in 1 Screwdriver Kit. Designed to include all you would need to repair small electronics. Comes with a anodized aluminum magnetized driver handle with ball bearing swivel top and rubber o-ring grips. - 60 mm extension and 130 mm flexible extension. If you have any questions about this product by Brifit, contact us by completing and submitting the form below. If you are looking for a specif part number, please include it with your message. 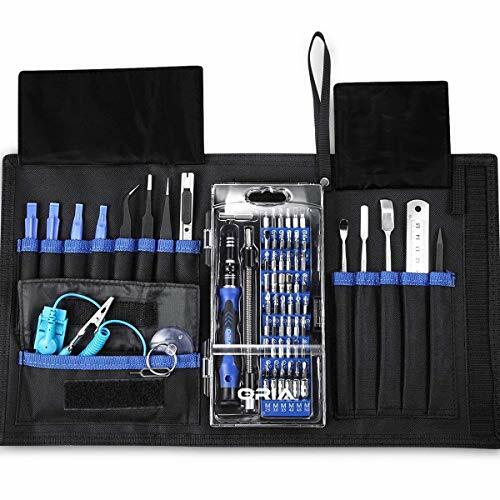 Screwdriver Set,Nanch 28 in 1 Electronic Tools Repair Kit for iPhone/PC/Laptop/Tablets,DIY Gifts for Men Him Husband Dad Father.